With the Doctor Who Christmas special just over a month away, what better way to get ready for it than with a Doctor Who themed Christmas sweater style t-shirt? I know that sounds a bit confusing but its just a t-shirt that looks like your traditional Christmas Sweater but with Doctor Who icons instead of Santa, snowmen and reindeer. The amazing people over at TeeFury are selling this fantastic Doctor Who Christmas style shirt for just $10 today only! 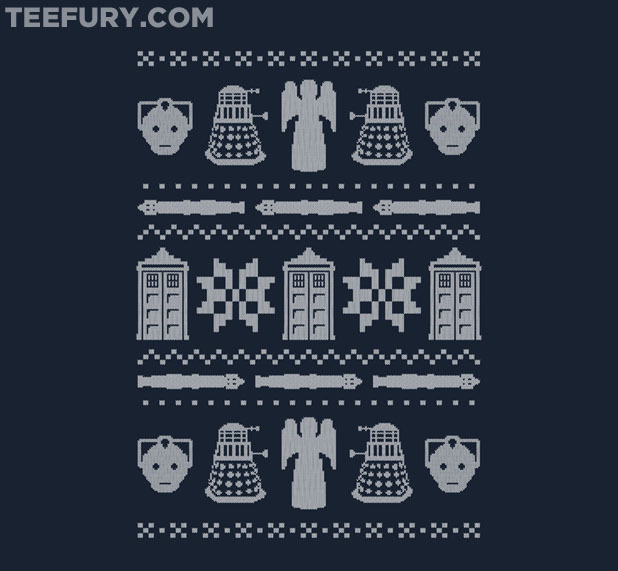 Not only does it look like a Christmas sweater, it features all kinds of iconic Doctor Who stuff like the TARDIS, sonic screwdrivers, Daleks, Cybermen, and Weeping Angels! There is all kinds of Doctor Who to love about this shirt!